Shhhh. It's PEACE & QUIET time! Escape to this secluded Smoky Mountain cabin for some quiet time in the mountains. Located in the Bear Mountain log cabin resort, the home is nestled in the woods up a long private driveway and near the end of the road. Only the sounds of nature, the birds singing, and the wind dancing through the trees can be enjoyed from the full length covered porch, decks, and fire pit area. Settle into a good book, or soak away your cares in the bubbling hot tub for some real PEACE & QUIET. 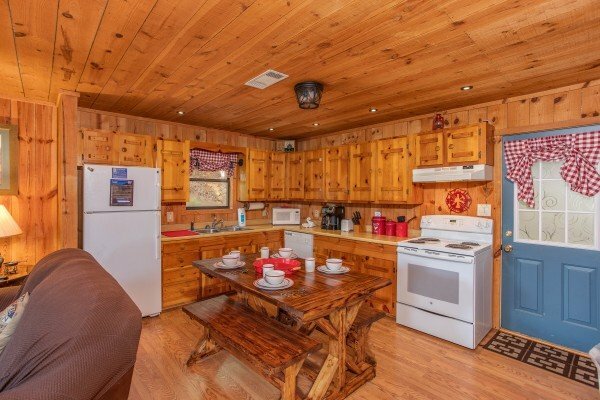 Inside this charming cabin includes a comfortable living room with leather sofas and LED TV. Don't forget to bring the groceries. The full kitchen and outdoor grill make dining-in a great choice. Up to 6 guests can spread out in 3 bedrooms and 2 baths for a truly quiet night's sleep. This private mountain cabin is just the place for some quality R & R. Call today and plan your getaway for some PEACE & QUIET in the Smokies! We truly enjoyed our time at Peace and Quiet. 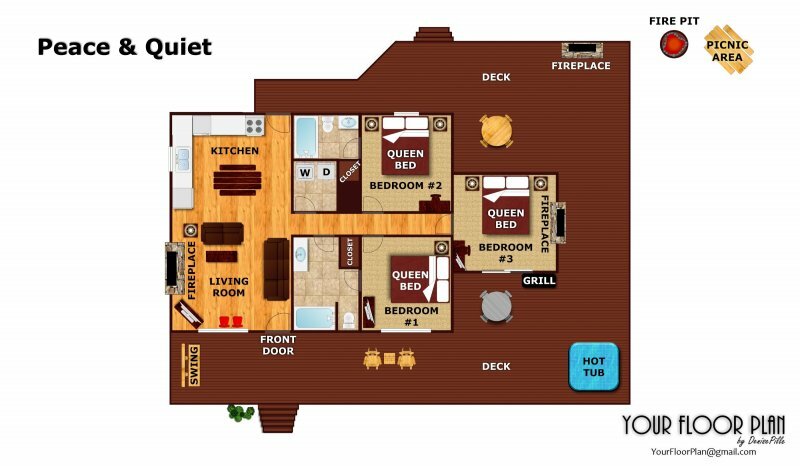 We like to try new cabins that match our wants and needs to see which ones we like best. Peace and Quiet was a great time! The location was excellent and the outside tranquility was one of the better ones we&#3been to. We had a great weekend , me , my husbands our two children and their spouses,!!! Definitely would love to make a yearly thing !!!! Would stay there again! We absolutely loved this cabin and it made our Christmas with our family one of the best and it has started a yearly tradition. A special thank you to Harrison who walked me through the entire process and was so patient with all of my questions. We willdefinitely do this again! Looking at a possible getaway in February. Thank you all again!